Actividad más que recomendable en referencia a la experiencia que se vive, entornos increíbles y sensaciones aún más. Pero no puedo darle una buena puntuación por la organización y el trato recibido. El conductor fue amable, pero no hablaba nada de francés ni inglés y mucho menos español. Contratamos la excursión con guía en español y sólo lo tuvimos en una actividad, en el resto no. El alojamiento del primer día era pésimo y estaba en muy malas condiciones y el del campamento bereber más de lo mismo y más aún si comparamos con los campamentos de los otros grupos que fueron mejores (teniendo en cuenta que algunos de ellos habían pagado menos) . Además no nos pararon a ver todas las cosas que ponia el itinerario ni nos explicaban en ningún momento lo que íbamos a hacer ni donde íbamos. Repito:una experiencia totalmente recomendable en la que se ven y se viven cosas increíbles pero la organización y el trato por parte de la agencia ha sido muy desagradable. The back-office experience was very bad but the tour itself was great and I can definitely recommend it! This was a fine trip, the second day was the highlight, a tour through a Berber village's gardens and a gorge ending in the desert. The itinerary is poorly explained but I enjoyed my trip. Tip:you can only take a regular backpack to the desert for day 2 overnight, pack accordingly. No sandboarding. The Camel Trekking and night in the desert were excellent but the rest was highly disappointing. We booked this trip on the basis of the camel trek and desert camp experience, which was excellent we got to trek in on camels at sunset for roughly 1 hour before going to the tents. We were hosted excellently by Berber guides who cooked us excellent food and serenaded us with some Moroccan Jams under a clear starry sky so clear we could see the milky way. The main issue with the trip were the guides not on the camel trek or the minibus driver who all seemed to be on the Take and trying to Squeeze as much money out of us as possible. 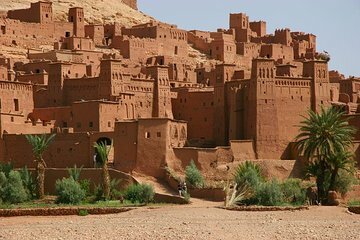 The first stop was at Ait Benhaddou which is a lovely Berber village that has featured in many films such as Gladiator, Lawrence of Arabia and more recently Game of Thrones. The village itself was lovely and the guide showed us round passing on some interesting facts but nothing I couldn't have got from a guidebook, and frankly I would have rather walked myself around. It irritated me when he asked for a sizeable tip at the end before encouraging us to buy scarfs that he said we would need in the desert for the record you do not need one which he clearly gets commission from the stall owner. The Second stop was at the Todra Gorge where we had the my worst experience in Morocco. The guide took us on a 45 min walk through the fields trying to explain that Berber people live in villages and nomads live in mountains. He wasted a good 20 mins explaining this simple fact before taking us to a carpet shop where we were subjected to a Hard sell on rugs made by a so called women's Cooperative showed round by a surprising number of wealthy looking Men!. When he finally took us to Todra gorge 2 hours after the start of the trip we had 20 mins to look about the gorge before being told we had to go. This guide then demanded a tip of 30 DRH per person for frankly wasting 2 hours of my time and denying me the opportunity to look around the gorge. I would rather have paid him 30 DRH to leave me alone from the start! The final gripe was with the sand boarding which was non existent! When we arrived at Marguza no one had any intention of taking us sand boarding and finally after making a fuss I was given a poor board and told to walk up the dune in the distance. I had time for 1 go and my Girlfriend did not get the chance. This was utterly useless and frankly should not be advertised as part of the trip, because there is to time or intention to do it on the part of the guides. In summary the camel trek and night in a Berber tent were excellent. The remainder of the trip is very poor and you can expect to be harassed for money by useless guides and spend most of the 3 days on a Bus including over 10 hours on the final day! The tour owner was awesome and really great in coordinating with us, despite our confusion. We met fantastic people on the tour from all around the world and it was a great value for the money. Beautiful views and amazing experience.